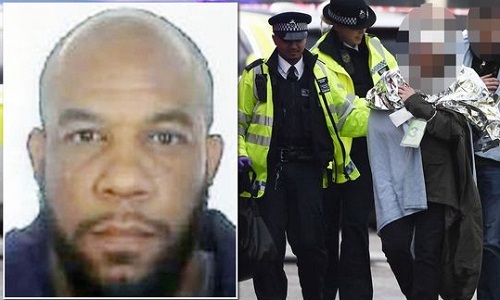 The mother of Westminster terror attacker Khalid Masood today broke her silence over her son's crimes and said she had shed many tears' for his victims. Janet Ajao, 69, is being protected by police for fear of reprisals at her country home after it was was searched by anti-terror officers. Mother-of-three Mrs Ajao said: "I am so deeply shocked, saddened and numbed by the actions my son has taken that have killed and injured innocent people in Westminster. "Since discovering that it was my son that was responsible I have shed many tears for the people caught up in this horrendous incident." His mum said: "I wish to make it absolutely clear, so there can be no doubt, I do not condone his actions nor support the beliefs he held that led to him committing this atrocity. "I wish to thank my friends, family and community from the bottom of my heart for the love and support given to us." Mr Ajao, 69, lives in the quiet country village of Trelech, Carmarthenshire, more than 200 miles away the scene of her son's terror outrage. Officers ruled out that grandmother Janet has any link to the crimes of her estranged son - but are worried that she could be targeted in her isolated home. Janet had the "Good Life" dream after moving to a Welsh farmhouse cottage, listening to classical music, keeping chickens and spending her time on handycrafts. Janet, 69, is known by villagers as a "respectable grey-haired lady" running her own business selling hand-made cushions and bags from her farmhouse. Janet - who called her son Adrian Russell when she gave birth to him at the age of just 17 - moved to their quiet Wales retreat from Tunbridge Wells in Kent. She and her 77-year-old husband Philip - who is believed to be of Nigerian background - turned heads when they moved in as the first mixed-race marriage in the tiny village of Trelech, population 745. It is understood she was estranged from her son and they hadn't seen each other for 20 years. Mr Ajao is believed to be in hospital seriously ill with cancer.